You can connect a mic to the AUDIO IN1 jack of the microKORG, and use it for a powerful vocoder that applies the tonal character of a vocal input to the sound of an oscillator, producing the impression that it is speaking or singing. While vocalizing into the mic and using the keyboard to play vocoder sounds, you can "freeze" the current tone of the vocoder by pressing the Formant Hold key. This allows you to continue to play the current vocoder sound, even when you are not vocalizing. This tone will be remembered when you write the vocoder program to memory. Several of the vocoder bank programs will sound even if you simply play the keyboard. These programs were written with Formant Hold turned on. Six types of arpeggio patterns (UP, DOWN, ALT1/2, Random, Trigger) are built in. You can adjust the length and resolution of the arpeggiated notes, and switch steps on and off to produce cool patterns easily. The microKORG provides two external audio input jacks. You can apply filtering or effects to an external sound such as a sampler or other audio source to create truly original sounds. 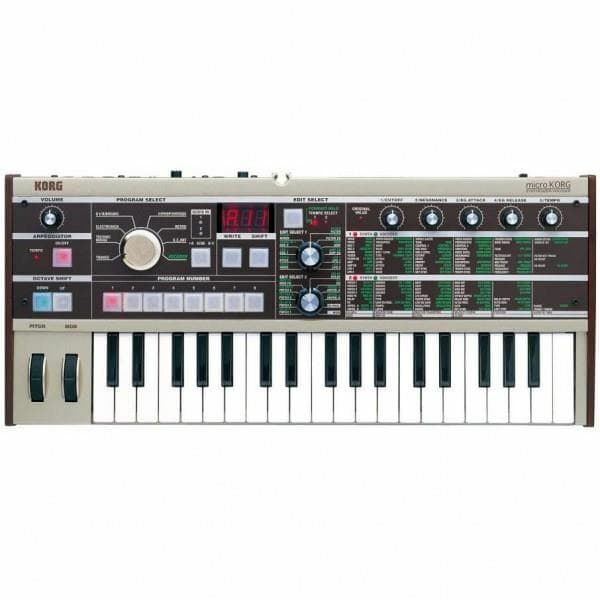 The microKORG is perfect for use in a computer-based music production setup. Since the five knobs on the panel can transmit MIDI messages (control changes), they can be used as controllers for software synthesizers. You can use its 37-note velocity-sensitive mini-keyboard for recording into your sequencer. 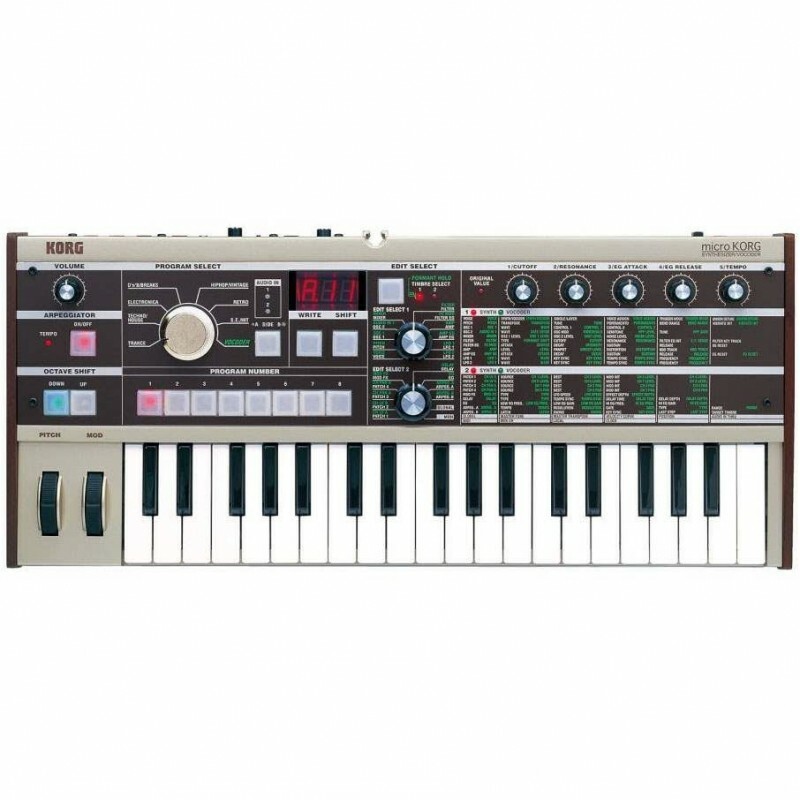 And of course the microKORG can be used as an external sound module with powerful synthesizer and vocoder functionality. Thanks to its small size and battery-powered operation it’s the ideal match for use with portable notebook computer systems. 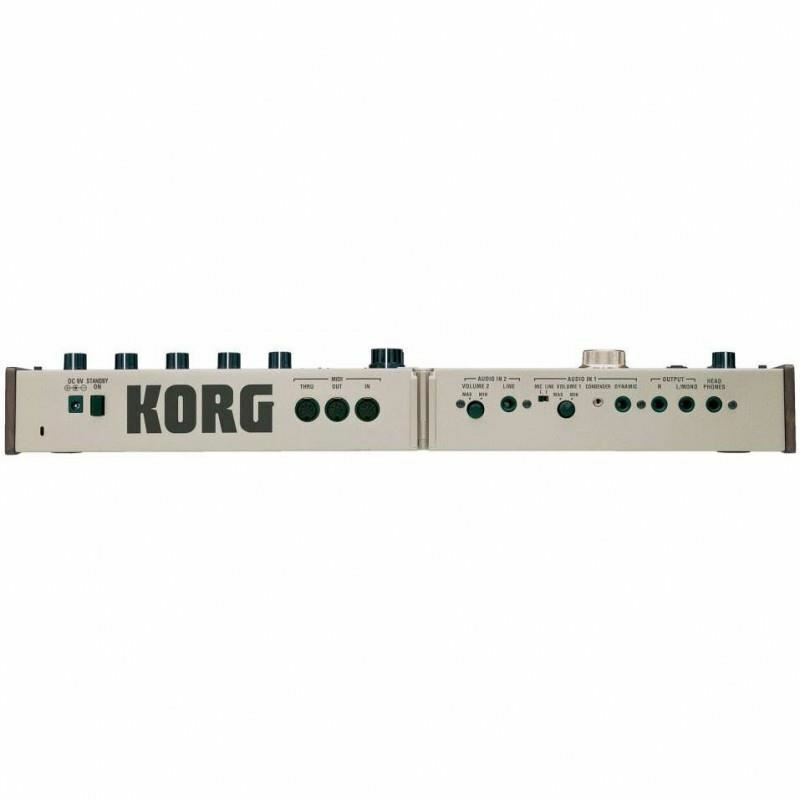 With its compact design, the microKORG is easy to carry and set up. There's no complex menu structure --- all parameters are right there on the panel for easy access to any function. Designed for live performance, all the important controls are large and easy- to-read, even on dimly lit stages. And by taking advantage of its realtime capabilities, you can make your stage sound even more powerful. With its beige-gold body color and wooden side panels, and a retro-feeling design that reflects a pop sensibility, the microKORG projects a powerful visual presence. Roland MP-100 Digital PianoPowerful, MP-100 akan menjadi pilihan ideal digital paino kelas entry-level untuk anda. Dilengkapi dengan teknologi audio piano yang diakui, konsisten, desain eksterior yang modern dan dipenuhi dengan berbagai fungsi tambahan yangmenyenangkan, MP-100 akan menjadi mitra ter..
Portable Yamaha Reface-CPYamaha Reface seris memiliki beberapa suara yang paling terkenal seperti seri DX7 dan CS Control Synthesizer dan menempatkannya dalam desain ultra-kompak dan sangat portabel untuk menciptakan suara dari keyboard Mini Mobile, sehingga memudahkan bagi musisi masa kini untuk me..
Yamaha FX-310 GuitarWidely acknowledged for the high quality and consistency across a wide range of instruments, from entry level to high-end. Yamaha is widely recognized as the choice of musical instrument for students and teachers. Yamaha instruments are used throughout the world by beginners and ..